We cordially invite the public to attend the award ceremony for the second Leszek Kołakowski Honorary Fellowship. The winner is Dr Caterina Tarlazzi, a historian of medieval philosophy at the University of Geneva. The ceremony will be held on 22 October 2018 from 3:00 to 4:30 pm at the Senate Hall of the Kazimierzowski Palace on the main campus of the University of Warsaw, Krakowskie Przedmieście 26/28. 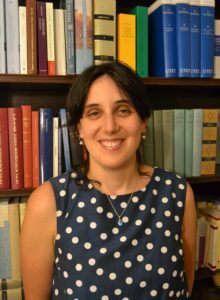 At the ceremony, Dr Caterina Tarlazzi will deliver a lecture entitled “The 12th-Century Debate over Universals: What It Is, and Is Not, About.” Remarks will also be given by the first laureate of the programme, Dr Dmitri Levitin, a historian of philosophy and ideas at the University of Oxford. A simultaneous translation will be provided. Admission is free of charge, but due to space limitations we request that guests confirm their attendance by 18 October 2018 at zaproszenia@fnp.org.pl, tel. (+48) 22 845 95 00. More information about the event is available from Agnieszka Kossakowska, External Cooperation Officer, agnieszka.kossakowska@fnp.org.pl, tel. : (+48) 22 311 84 27. Dr Caterina Tarlazzi specializes in the history of medieval philosophy, and her research interests are focused on the issue of universals, with particular attention to the thought of Peter Abelard. In her research she combines an interest in logic and metaphysics with a quest for sources of unpublished manuscripts and textual criticism. Her published works include a critique of Epistola de anima by Isaac of Stella. She has also discovered a new version of De discretione animae, spiritus et mentis by Achard of Saint Victor, as well as a previously unknown manuscript of Periesichen Augustini, a text resembling the works of Alan of Lille. Her recent research investigates the realist theories of genera and species, starting with the 12th century, on the basis of both published and unpublished sources, and explores their connections to the views of Peter Abelard. Dr Caterina Tarlazzi defended her doctoral thesis in 2013 in the cotutelle model, earning a Doctor Europaeus degree granted jointly by Università degli Studi di Padova in Italy and Université Paris IV Sorbonne in France. She was then awarded a three-year fellowship by the British Academy at the University of Cambridge. Since 2017 she has worked at the University of Geneva. She has also been awarded a number of fellowships under grant programmes, including the Ambizione Fellowship from the Swiss National Science Foundation and a Marie Skłodowska-Curie Global Fellowship, as well as several distinctions and awards for her research.